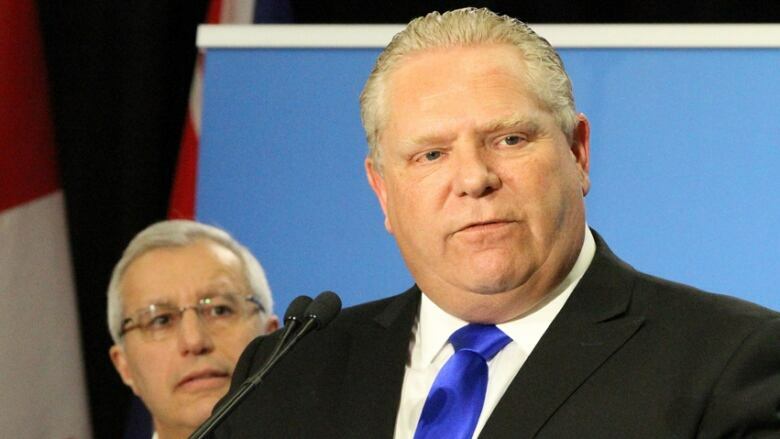 In a rare move, Ontario's Progressive Conservative leader will not bring journalists with him on the campaign trail this spring. Ontario's Progressive Conservative leader will not bring journalists with him on the campaign trail this spring, a rare move experts say suggests the Tories are keen to keep the unpredictable populist politician out of the hot seat as he takes on two more seasoned rivals. Doug Ford's team said Wednesday the former Toronto city councillor will not have a media bus following him as he criss-crosses the province ahead of the June election, an accommodation traditionally offered by Ontario's party leaders to facilitate coverage while they hold multiple daily events in different cities. Premier Kathleen Wynne called Ford's move "unusual" and said her party will continue to have a media bus. "I think it's an important part of the democratic process," she told reporters on Thursday. Wynne said it will be up to Ford to explain why he's ditching the bus and why it looks like "there's some hiding going on." Wynne also called on the PCs to release a clearly-articulated platform. Ford hasn't done that, and won the leadership by rejecting many of the plans in the People's Guarantee platform put forward by former leader Patrick Brown. And while this approach may prove effective politically, it's concerning for democracy, they say. "He is attempting to bypass the accountability function of the free press by limiting access to his campaign. This will not prevent coverage, but it alters the degree of access and creates a different, more opaque degree of transparency in the campaign," said Tim Abray, a former journalist and current teaching fellow in political science at Queen's University. "This should not be blown off as insignificant," he said. It's not new for politicians to try to control the narrative around their campaign by restricting media access in various ways, said Tamara Small, a political science professor at the University of Guelph. More recently, the federal Liberals have successfully peppered newspapers across the country with photos taken by the prime minister's own photographer — a move the Ford camp may try to replicate if fewer news organizations send staff photographers, she said. "The narrative is that you're not going to get that photo that's unattractive," Small said. "You're going to get the photo where the lighting is perfect and the right people are in the background and all of that kind of stuff and it tells the story that they want to tell." "I wouldn't be surprised if they're trying to make sure that the plan is as clear as possible now so that they can operate as strategically as possible," she said. "One of the things that makes Doug Ford very attractive to people is his ability to sort of speak off the cuff and all that kind of stuff but that is also the stuff...that could become problematic," she said. The Tories may also be trying to shift the focus from their leader onto other issues such as their policies, as the federal Liberals did in the 1980s in the campaign for a then-unpopular Pierre Elliott Trudeau, said Jonathan Rose, a political science professor at Queen's University. "It'll be interesting to see if Doug Ford maintains that script and doesn't do as many photo ops as the other leaders," he said. "The reason why you do that, of course, is to focus on the policy and avoid any kind of problems with Ford going off-script." Ford's campaign would not say whether he will be holding daily events during the campaign, nor would it confirm whether he will deliver a fully costed platform before the election as promised. "We have a plan for the people of Ontario and we will be rolling it out piece by piece over the coming weeks. Stay tuned," Lantsman said. In any case, Ford's decision to scrap the media bus is a "shot across the bow to the media," but the issue is unlikely to ruffle voters, said Rose. "Voters don't care about that and in fact it might play well to Doug Ford's base that he is not playing nice with the media," he said. "The U.S. wave of populism that has sort of washed over Ontario since his election may be evidence of that."